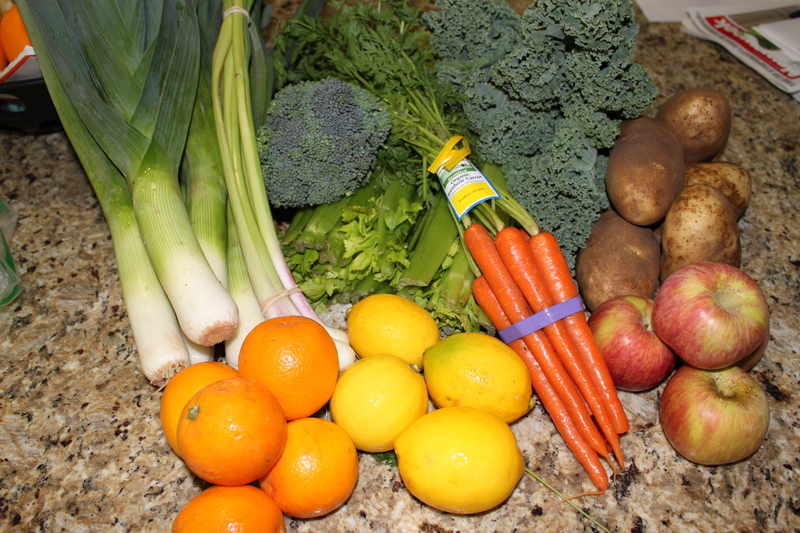 This week’s delivery included leeks, baby broccoli, celery, kale, potatoes, carrots, green garlic, fuji apples, oranges and Meyer lemons. I love green garlic season. I meant to grow our own garlic for this spring season, but I missed the opportunity to plant garlic bulbs last fall. Green garlic is such a delicious addition to salads and soups. It isn’t as strong as regular garlic, which makes it a perfect addition to a greek salad. I also enjoy using it with lemon juice to create a quick salad dressing. The Meyer lemons are screaming lemon bars to me…perhaps! Pretty good variety. Even though we’re moving outside of cold weather, I still love celery soup.